BOSTON - Sophomore Aerin Frankel pitched her fifth shutout of the season with 22 saves as the No. 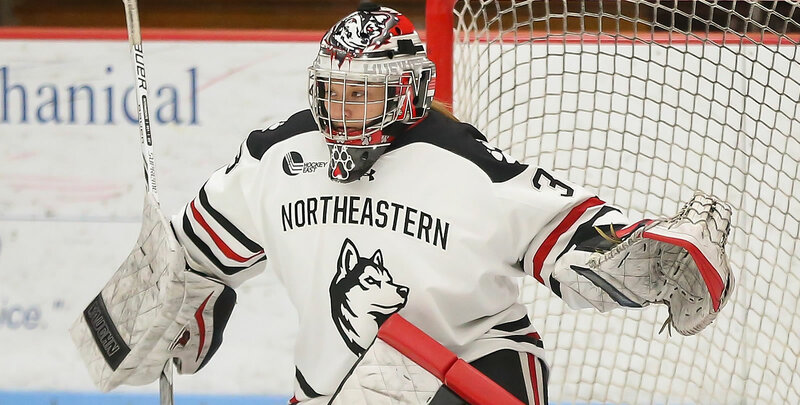 5 Northeastern women's hockey team bounced back with a 3-0 victory over Holy Cross on Sunday at Matthews Arena. Sophomore Veronika Pettey, senior Maddie Hartman and senior Kasidy Anderson scored for the Huskies (13-2-2, 12-1-2 WHEA), while sophomore Skylar Fontaine dished out two assists. Freshman Alina Mueller also recorded an assist to extend her point-streak to 16 straight games. Pettey was credited with the eventual game-winner when she forced a turnover and fooled Holy Cross netminder Jada Brenon (34 saves) on a breakaway at 6:31 of the first period. Hartman doubled the lead with a power-play goal at 18:53 of the second stanza when she took a Tori Sullivan pass and wristed a shot through traffic from the right point. Anderson put the cherry on top at 12:56 of the third period when she rifled a shot home from the top of the left circle following a drop pass from Fontaine. Three goals was plenty of support for Frankel, who stopped seven shots in the first, seven shots in the second and eight more in the third to improve to 8-0-0 in WHEA play this season. Northeastern will now have over a month off before returning to action on Jan. 5-6 against Clarkson in Belfast, Northern Ireland.